All Children Reading: A Grand Challenge for Development recently published an external evaluation and blog post about World Education’s mobile learning interventions to improve early literacy teaching and learning in Cambodia. The primary focus of the independent evaluation was the mobile learning (m-learning) component of Total Reading Approach for Children Plus (TRAC+) and specifically, the use of Aan Khmer, a game-based Android application developed by World Education to help children learn Khmer alphabetical principles, vocabulary, and fluency in low resource environments. The seven-month evaluation set out to answer the question, “How and to what extent does the integration of m-learning in TRAC+ enhance the literacy of early grade students?” Using a mixed method approach, the researchers collected and analyzed data from: a collective case study of 15 schools alongside the Early Grade Reading Assessment (EGRA) and School-based Test About Reading (STAR), 73 individual interviews with school faculty and students, and 27 focus group interviews with students or peer tutors. Teachers and students held positive views of TRAC+ and its m-learning component. High-quality teaching and learning materials, including Reading Toolkits which contain 21 different games, storybooks and instructional videos demonstrating how to plan, facilitate and assess activities. Through World Education’s Aan Khmer and TEST apps and other ICT-enabled resources and approaches, educators and learners are engaged and empowered. Teachers apply their training in the classroom, educating and encouraging students using interactive reading games and other engaging tools that are improving literacy skills in Cambodia. 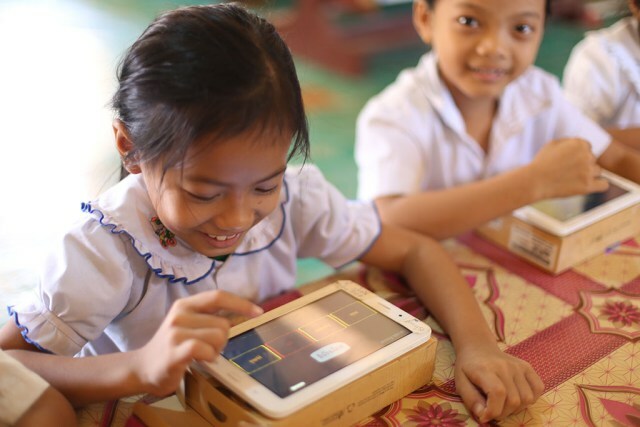 Learn more about how World Education is augmenting its early grade reading programming with ICT-enabled approaches and tools in Cambodia. Through these various interventions, students receive the targeted, personalized instruction that they need to strengthen their Khmer literacy and reading skills. Note: The evaluation was conducted by a team of researchers from the Graduate School of Education at the University of Western Australia under the Digital Learning for Development (DL4D) project of the Foundation for Information Technology Education and Development (FIT-ED) of the Philippines. More information is provided in the final report.